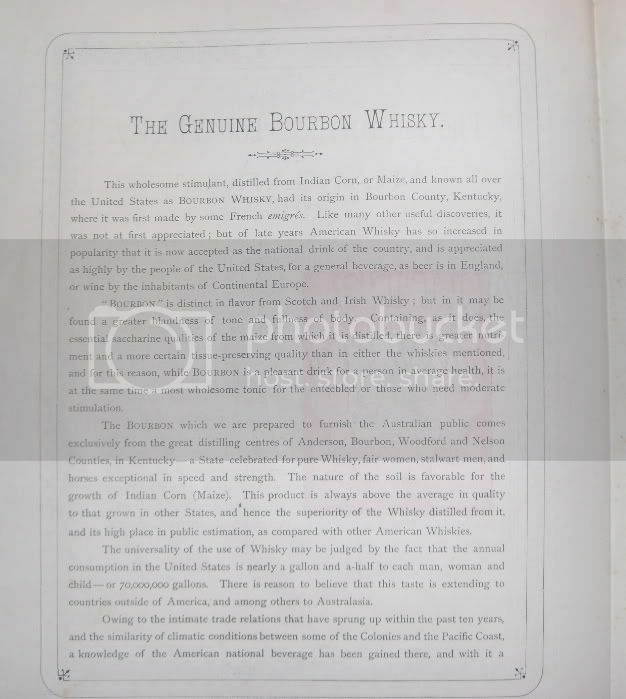 By 1883 Hotaling's successful ventures in Australia led him to trademark a brand of whiskey especially for the Colonies. 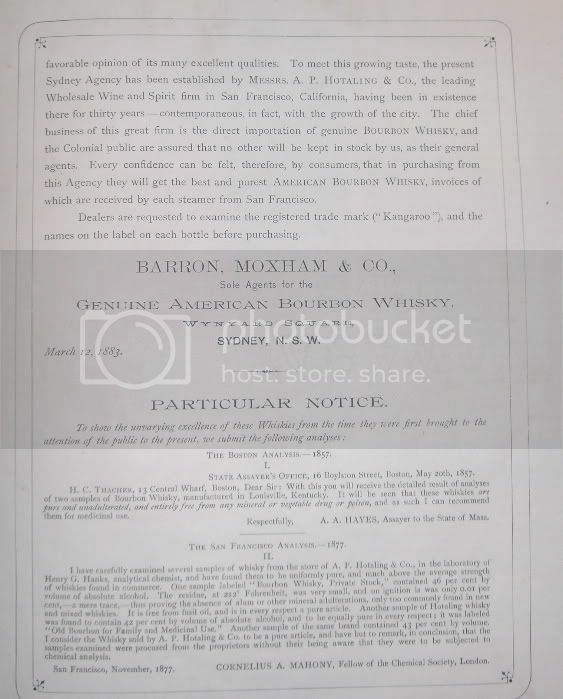 This time, he chose Sydney, New South Wales, and the Barron, Moxham Co as his agents. The new brand was to be known as Kangaroo Whiskey, and featured a boldly embossed "Roo" on the bottle's face. The bottles were blown in San Francisco, filled at Hotaling's Jackson Street warehouse and shipped to NSW. To date, the Kangaroo bottles remain extremely rare, with only a handful coming to light, and only one actually making it to the US. I "discovered" the existense of this bottle quite by accident. A number of years ago, while going through some early papers, I came across one of Hotaling's circulars that advertised this product. WHOA!! That started the ball rolling, and after many phone calls and letters back and forth to Aussie collectors I finally tracked the bottle down. The problem was that the owner was a notorous "flip-flopper", a guy who played me like a fish. He found the bottle while diving in Sydney harbor, so really had no idea of it's value or history. Well, no sooner did I explain the entire story to him and express my desire to purchase the bottle from him, he got a big case of the "gimmies". At first he wanted $1500AUS, but that changed almost immediately after he talked to some of his buddies. Suddenly, the price jumped to $7000AUS, which I agreed on. Maybe I sounded a bit too eager, so he backed off again. Somehow, he got wind of Glass Works Auctions and the big bucks that Yanks were paying for bottles, and he contacted them. When the bottle finally came up I was so disgusted with the entire proceedings that I could care less about bidding on it. The bottle sold for a very high price and now resides in Ken Schwartz' collection. 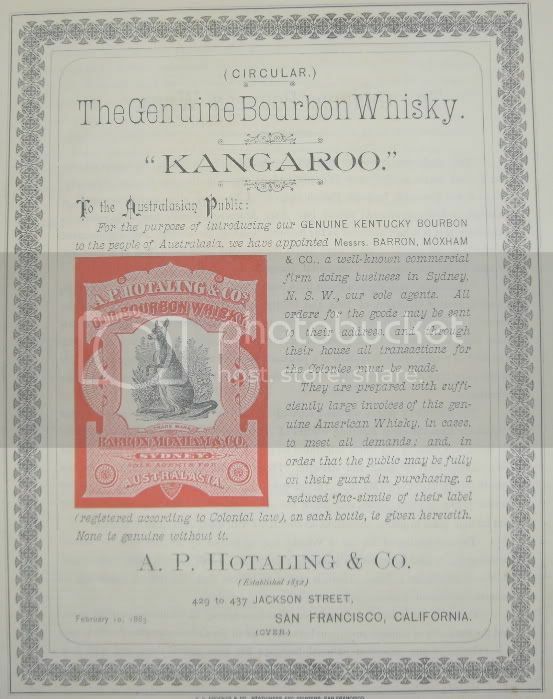 Included below are some of the advertisements and information for the Kangaroo Whiskey. As far as how many were actually blown, I have no idea. All records have been lost, so the numbers will never be known, but they could be substantial. In my searches, 6 examples have turned up. There is one "mint" bottle and 4 with some sort of "minor" damage in Australia. All came from Sydney area tips. Ken's Kangaroo, and those other 5, represents the entire known population of this most desired Western Whisky. Killer post. The ad and label you found are spectacular !! Can you re-post the photo of the bottle?? It seems to have disappeared. I want to save it. The broken one I have doesnt have a "Westerny" look to it, but is still a killer bottle.